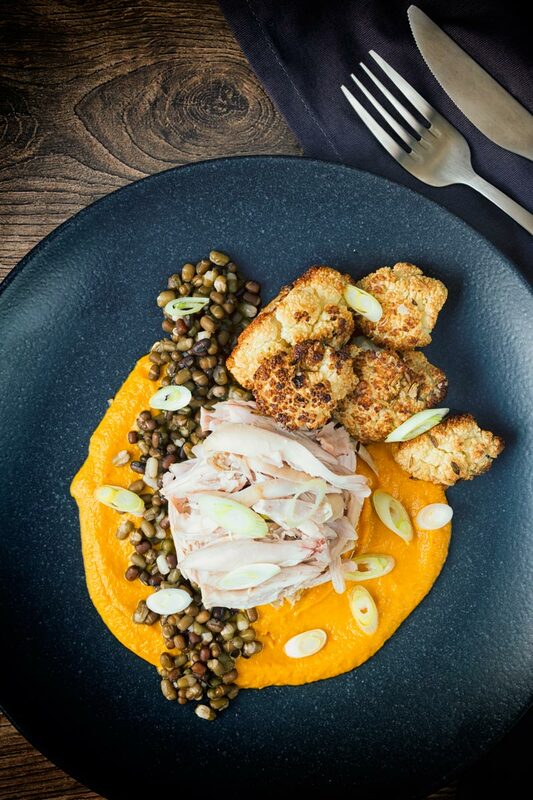 These slow cooked rabbit legs are poached in an Indian flavoured broth and served with a spicy carrot puree, roasted cauliflower, and mung beans. 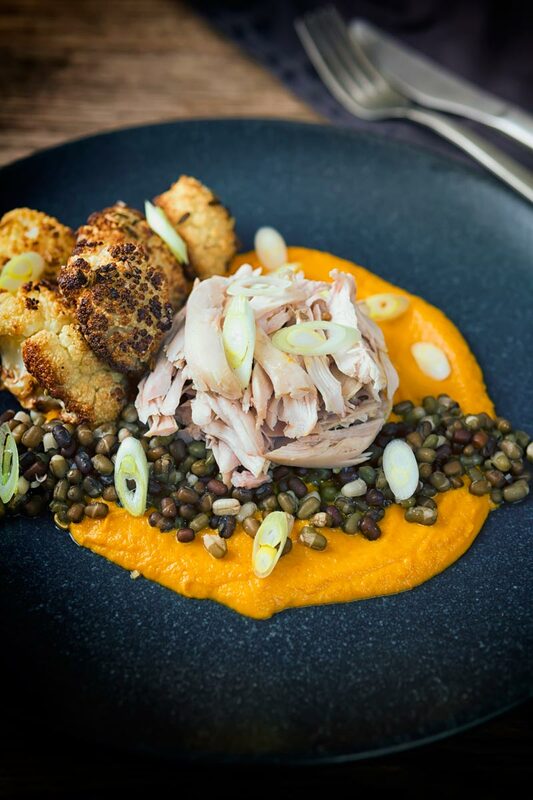 Indian Slow Cooked Rabbit Legs With Cauliflower and Carrot. 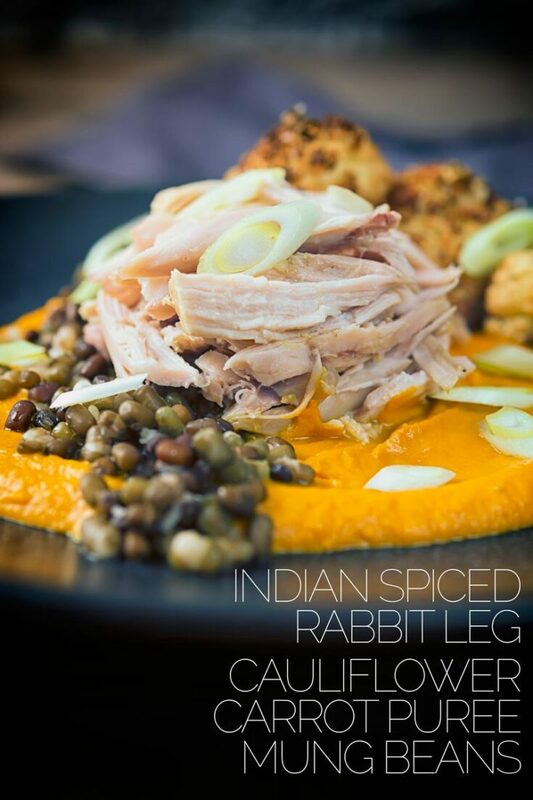 Rabbit is one of those meats that has fallen out of favour, but it tastes great and as this Indian inspired rabbit leg recipe shows, it is really versatile! Rabbit has a subtle flavour, but a more pronounced and individual one than chicken. Particularly the legs, so here they are slowly and gently poached in a stock of Indian aromats. It is a relatively similar technique to the one I used in my rabbit pasta recipe. This stock then helps us let down the fiery carrot puree. But when you make this you should have plenty of this stock left over. I implore you to save it and either freeze or use it as the base for a soup. It is incredibly tasty and it would be a crime to pour it down the sink. Indian food is often thought of as curry, a hearty brown stew. But Indian food contains the most exciting and wonderful combination of aromatic spices. These slow cooked rabbit legs pick up on the flavours of cumin, coriander, and cardamom along with the often ubiquitous garlic and ginger. 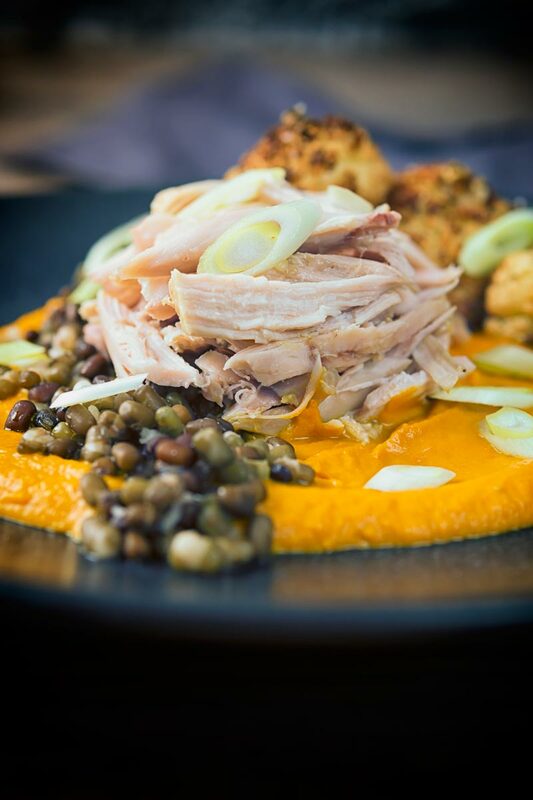 The subtle flavours are complemented with a sweet carrot puree. A puree flavoured with fiery chili and earthy turmeric. That sweetness needs a bit of acid, so the mung beans have a cider vinegar dressing. 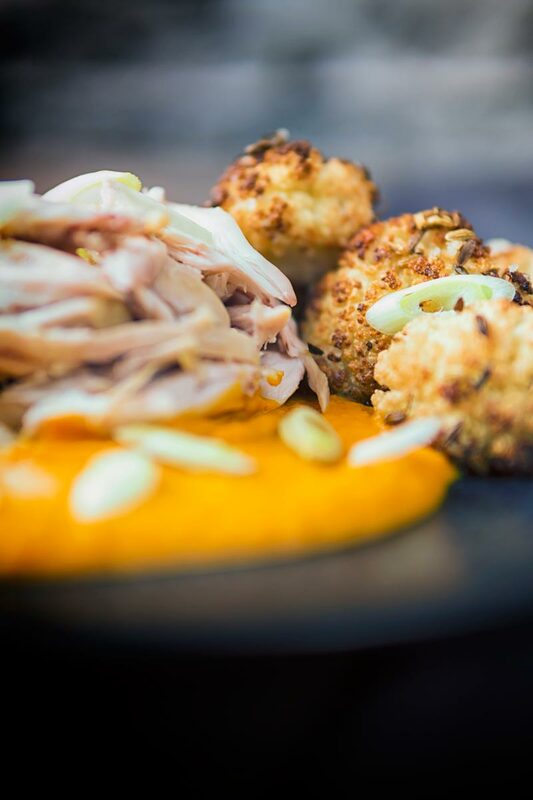 We round all of this out with some wonderfully tender roasted cauliflower florets flavoured with sweet fennel seeds. Essentially we have all the flavours of a great curry but it is just a little more refined. The Secret To Cooking Rabbit. Cooking rabbit can be a challenging experience, it is a very lean meat so can dry out very quickly. The secret to perfectly cooked rabbit is low and slow. There are quicker techniques, particularly with the loin. But in the main, a gentle braising or roasting will result in a beautifully cooked rabbit. It is the technique I favour in all of the rabbit recipes I cook. Also as a point of reference, this and all of my rabbit recipes are designed for a farmed rabbit. This is to ensure that I can provide a base point for the consistent cooking of this recipe. Wild rabbits will all be a little different and you will need to ammend and use your cooks intuition to guide you. If you are intrigued by rabbit, here are a few of other rabbit recipes to take a look at. Old School Rabbit Stew with Pearl Barley. Rabbit Ragu with Orecchiette Pasta. This time of the year often leads many of us to keep an eye on the purse whilst shopping. However, lower cost ingredients does not mean food that looks or tastes frugal. 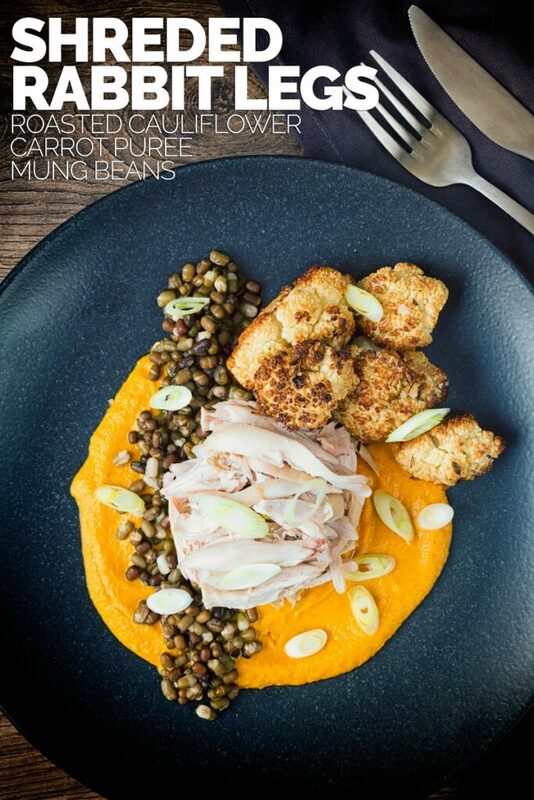 All of the ingredients here are cheap, rabbit leg, cauliflower, carrots and mung beans all cost pennies. Add in a few store cupboard spices and you have a nutritious meal packed big flavours. A meal that looks great and one that is not gonna put a dent in the new year finances! 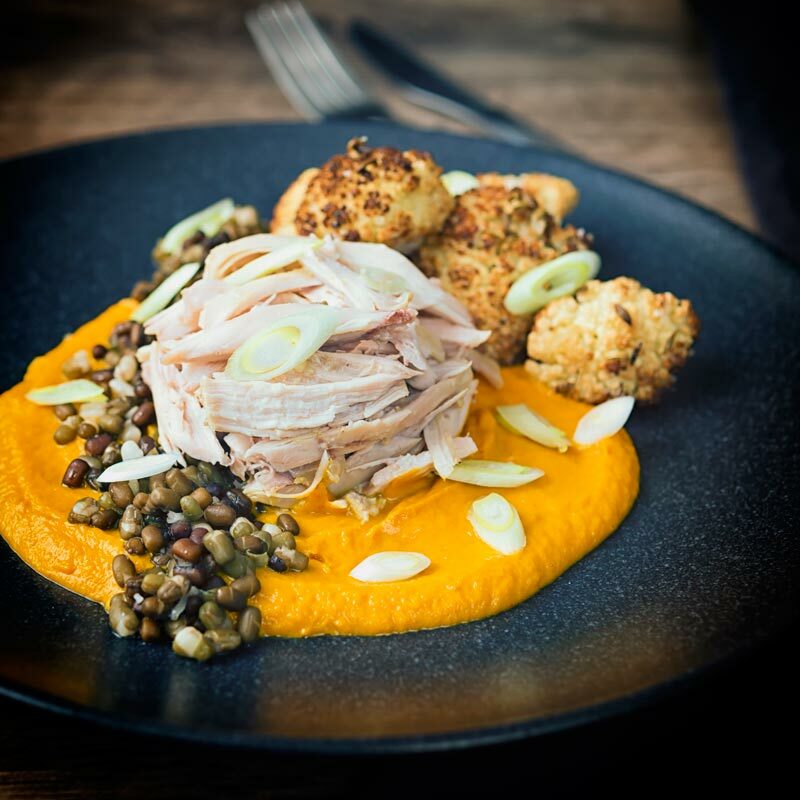 Slow cooked rabbit legs that are poached in an Indian flavoured broth form the centrepiece of this deconstructed curry that tastes every bit as good as it looks. The carrot puree is worth its weight in gold alone! Soak your mung beans for an hour and a half. Slice your onion in half and then slice your ginger into slices around 2-3mm thick. Bring the stock to a gentle simmer with all of the ingredients for the rabbit legs and cook for an hour and a half. Allow to sit and in the stock whilst we prepare the sides. Drain the mung beans and then place in fresh water and bring to the boil and cook for 30 minutes. Heat your oven to 200°C or 400°F. Take your cauliflower florets and toss in the oil, salt and fennel seeds, place on a baking tray and roast for 30 minutes. Peel and slice your carrots into 3-4mm thick coins. Add the butter for the carrots to a pan and melt over a medium heat. Add the carrots, and then the dried chili, coriander and turmeric. Stir to combine and then pour in 75ml of the poaching liquid from the rabbit. Add a lid and simmer on low for 25 minutes. 10 minutes before everything is ready, reheat the rabbit legs in the stock by adding a medium heat. When your carrots are cooked add to a blender with the cooking liquid and blend to form a smooth paste. Drain the mung beans and season with the oil, vinegar and salt and pepper to taste. Finally, shred the rabbit legs and serve. 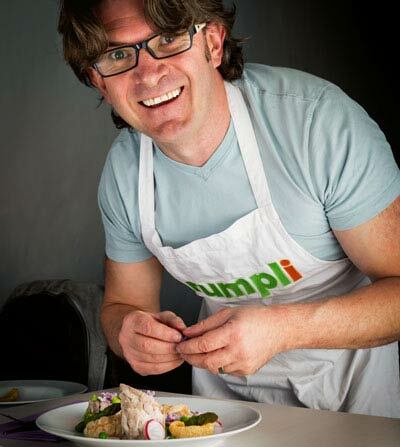 Just stumbled across your site – love the look of your recipes – very much to my taste – have already saved lots! Am definitely going to try the rabbit – though here in Australia it is actually quite expensive – we can only get farmed rabbits. Hi Ann, thanks for taking the time to write to me… I think in many ways farmed rabbit leads to a much more ‘repeatable’ recipe and my creations are all developed for farmed rabbit as it is the product that most people can get. Just one word to describe this recipe -Awesome. An easy way to cook rabbit the family will love! I would seriously make this just for the broth. My broth doesn’t make it to soup very often as i tend to drink it. Anyways, this sounds absolutely incredible – great flavors! I love rabbit but unfortunately my hubby isn’t so keen even though it’s actually a very healthy lean meat. I’ve cooked it with pasta, but never with Indian flavours. This meal looks and sounds fabulous. One to try even if I have to eat it all myself! I’m obsessed with cauliflower AND Indian food, so this looks heavenly!